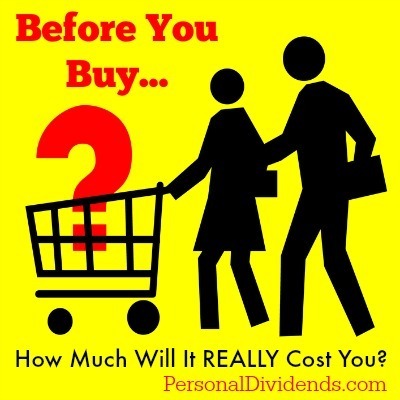 Before You Buy: How Much Will It REALLY Cost You? Often, when we make purchases, all we think about is the sticker price of the item. You pay the amount on the price tag; rarely do you think about the continued cost of the item. The reality, though, is that an expenditure of your financial resources results in costs later on, whether you are getting a really good deal or paying full price. While you don’t have to completely avoid spending money on unnecessary things, one of the best things you can do for your long-term financial health is to engage in conscious spending. By considering the true, long-term cost of your purchases it’s possible for you to revamp your spending so that you cut back on the things that aren’t important to you. The first thing to think about when you make a purchase is whether or not you are making a purchase using a credit card. Next, you need to determine whether or not you are carrying a balance. The interest on a credit card purchase can really add up over time, resulting in you repaying two, three, or even four times what you originally borrowed. Other purchases made with debt can affect you the same way. Sure, you can buy a more expensive car and stretch out the loan term. But you’ll also probably pay a higher interest rate as a result. That higher interest rate can cost you thousands of dollars over the life of the loan. Before you make a purchase on credit, think about the consequences of interest. Chances are that your debt purchase will cost you much, much more over time if you use credit. If you buy something with a credit card, make sure that it’s one of the best rewards credit cards, and that you pay off the balance before you end up paying interest. Perhaps you decide to make your purchase without resorting to a credit card. Good for you! But that doesn’t mean that you aren’t incurring additional costs as a result of your latest purchase. In fact, the true cost of ownership as it relates to cars can be rather surprising. But it’s not just cars and homes. Think about what you have to do to keep up with appliances that you buy. Even little knick-knacks bought for display come with small maintenance costs over time. If you habitually buy things, do you have a place to store them? Many people find themselves with so much stuff that they feel they need to buy a bigger house, or that they need to rent a storage space. Once your purchases result in that type of outcome, you are adding a new monthly cost to your budget. Consider that before you fill your home with unnecessary items. What Could the Money Have Been Doing Instead? Perhaps the hardest thing to visualize is what the money could have been doing instead. This is part of any purchase’s true cost. Rather than looking at interest costs (for things bought with debt) and maintenance costs, you should also consider what else that money could have been doing. What if you had invested the money, instead of buying something unnecessary and expensive? For instance, let’s say you decide that your 42″ TV isn’t good enough anymore, even though it works fine and you’ve only had it for a couple of years. You decide to buy a 60″ HDTV for $900. If you had invested that money and earned an annualized 6% rate of return for the next 30 years, you would have earned $4,520.32 in interest, making the true cost of your expenditure $5,420.32. Don’t forget, though, that you also have other potential costs, depending on whether you financed the TV and have to pay interest, and what sort of maintenance is required. There are some expenditures that are worth the extra cost. However, not everything is. Before you spend the money, really think about what it’s adding to your life. Is it really worth the extra cost you’ll pay over time? Chances are, you could put that money to better use.